How can you predict the best moving weather in Boston? Some people use the weather beacon that crowns the Old Hancock Building. Historians call it the Berkeley Building. Boston locals refer to it as the Old John Hancock. It claims a prime location at 200 Berkeley Street, in the heart of the Back Bay. 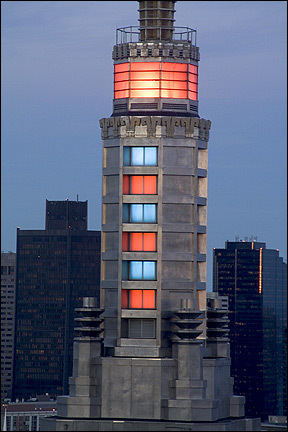 The building is known for the color-coded weather beacon at its summit, which broadcasts light patterns as weather forecasts. During baseball season, the flashing red lights inform Red Sox fans that the game has been cancelled on account of weather. The beacon was first showed its lights on March 15, 1950. Forecasts from a meteorological agency located on the 26th floor controlled the light patterns. It stayed lit until 1973, when legislators turned it off to set an example during the ongoing energy crisis. Bostonians rejoiced when their favorite weather forecaster came back to life in 1983. Of course, these students were trying to save money with a DIY move, but the damage to their belongings might clearly illustrate the idea of penny wise, pound foolish. Professional packers know the right packing supplies for any weather. Professional movers know the best routes to take to any neighborhood, and understand the importance of avoiding moving truck crashes.